See? I’m not a total weirdo! In fact, it is delicious! In fact, come to think of it, chocolate chip cookies might even be better! Anyway, the best part of using digestive biscuits or graham crackers or chocolate chip cookies is that, because you’re using the biscuits, you don’t even have to turn on your oven to make this pie! I didn’t feel like making a whole pie, though… I wanted something a little cuter. 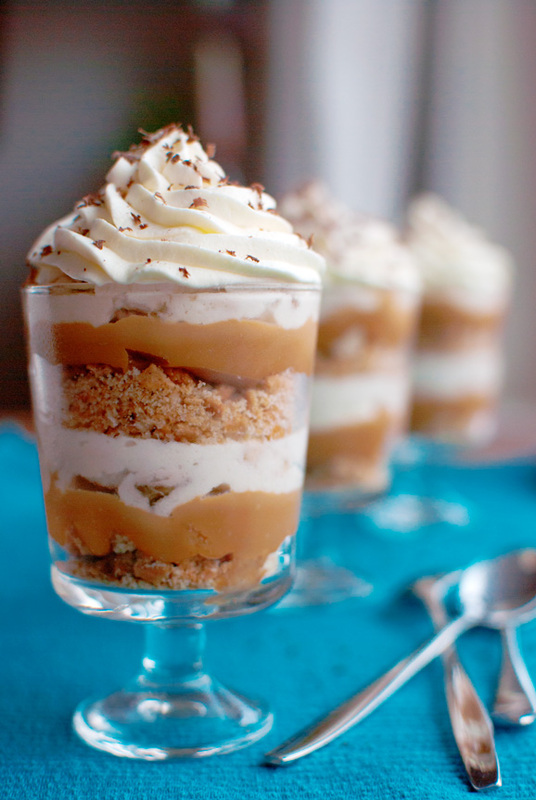 And what’s cuter than a pretty, layered dessert served in individual little glasses? Well, a lot actually. Little Lucy, the Rocking Rebel, little girls with pig tails, my nephew who asked me if I could make him a scary (scary!!) orc cake for his birthday last week to name but a few, but I think pretty layered desserts served in pretty glasses are pretty cute too! 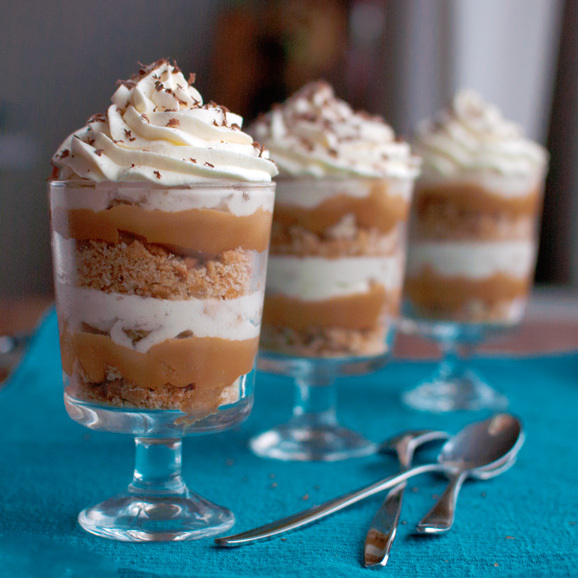 So that’s what I made: Banoffee Pie Desserts! Well, you can, but why would you want to leave the chocolate out? Anyway, throwing these desserts together was a breeze. Really just a matter of crumbling biscuits, spooning some warmed dulce de leche over the crumbles, plopping in some banana-cream mixture and repeating. It took me a while, though… The hardest thing about this recipe, is making the desserts look pretty. As you spoon in the dulce de leche or plop in the cream mixture, the sides of the serving glasses tend to get all mucked up, so after I added the first cream layer I had to clean the sides of the glass up a bit with some paper towel. Not very difficult, it just takes a little time. 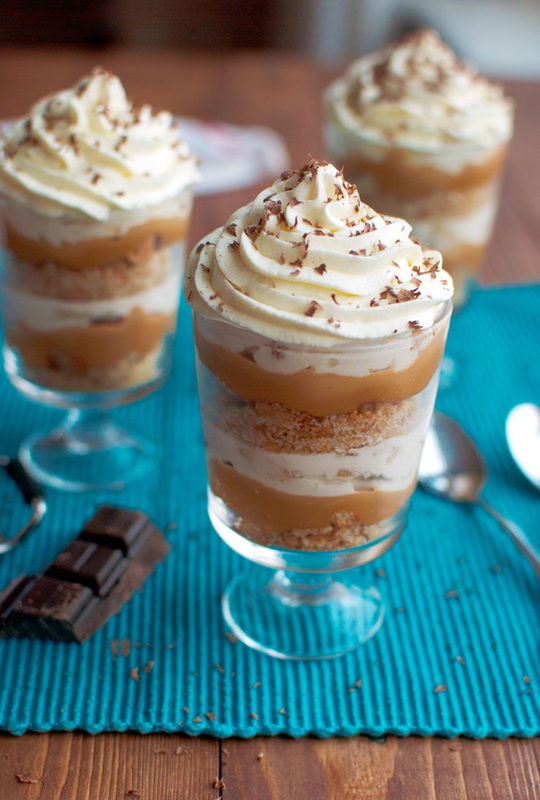 Apart from that, these desserts are a no-brainer! Just look at that spoonful of goodness! 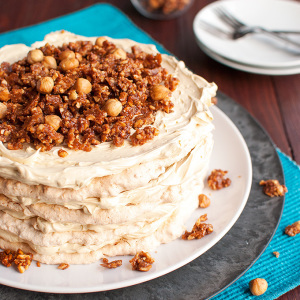 One final tip:: don’t eat this desserts layer by layer! Instead, try to get your spoon all the way to the bottom of the glass, getting as much of the good stuff at the same time as possible. Get 4 pretty serving glasses or bowls ready. Each of the glasses I used could hold 200ml (or ¾ cup and 4 teaspoons) of water. 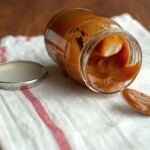 In the bowl of a double boiler, gently heat the dulce de leche until runny, but not hot. 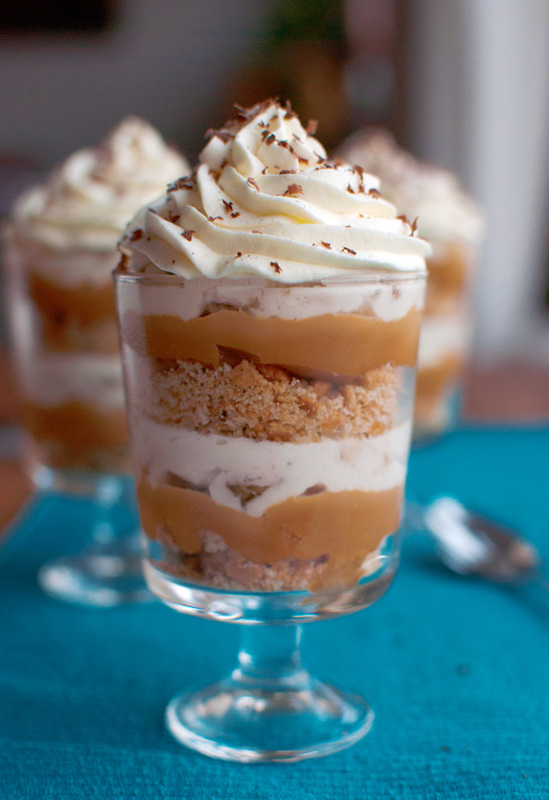 You don't want the whipping cream to melt once you plop it on top of your dulce de leche layer. Crumble 1 digestive biscuit or graham cracker into each of the serving glasses. 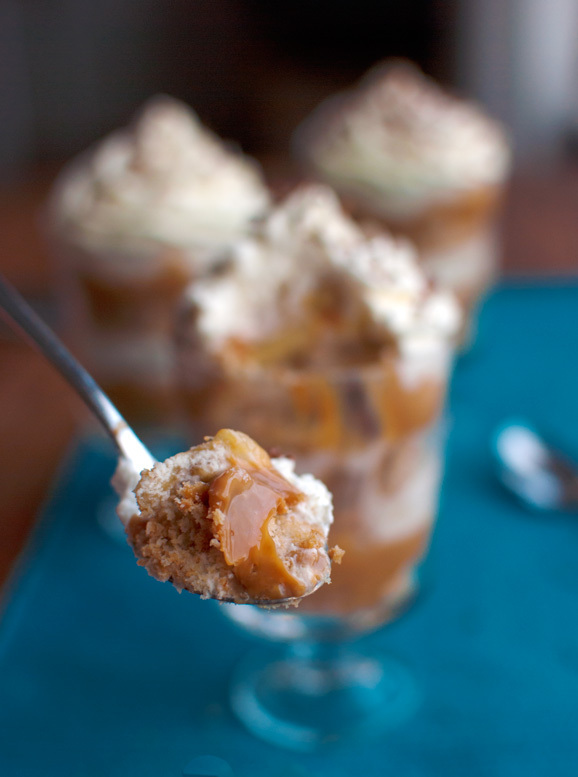 Top with 2 tablespoons of the runny dulce de leche. 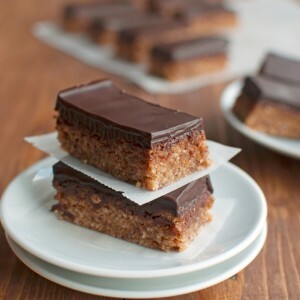 Set aside while you make the banana filling. 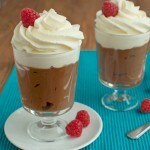 In a medium-sized bowl, whip together the whipping cream and sugar until it holds stiff peaks. Transfer half of the whipped cream to a piping bag fitted with a large star tip. Peel the bananas and cut them in half lenghtwise. Cut each half in small pieces and add the banana pieces to the whipped cream in the bowl. Using a rubber spatula, fold the banana into the cream. 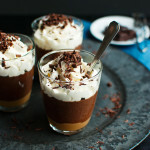 Plop spoonfuls of the banana and cream mixture on top of the dulce de leche layer in the serving glasses, until the banana layer is about 1-cm or half an inch thick. Smooth the cream layer down with a spoon, trying to push the cream up against the sides of the glass to make it look pretty. By now, the sides of the glasses are probably a bit mucky. Use a paper towel wrapped around your index finger to clean them up a bit. Next, crumble the remaining biscuits into the serving glasses (1 in each glass), spoon in 2 more tablespoons of the dulce de leche and divide the remaining cream mixture over the glasses. 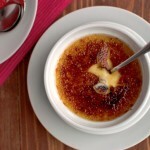 Pipe a soft, whipped cream rose on top of each dessert, covering the cream mixture completely. 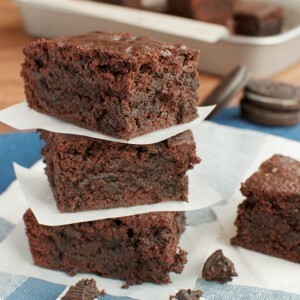 Grate some dark chocolate over the top of each dessert and serve immediately!